“Hedge funds are for suckers,” Bloomberg proclaimed in a headline in 2013. According to the article, one reason they’re “for suckers” is they are expensive. The industry standard for the management of these funds is known as the “2 & 20” rule: firms take 20% of the earnings on the money they manage, and a 2% “management fee” of the total assets. Once it was set up, this incentive structure was kept to attract top management and analytical talent to a firm. The industry made the fortunes of some of the wealthiest, most influential, and most infamous financiers ever to have lived: George Soros, James Simons, John Paulson, Philip Falcone, Kenneth Griffin. And yet, even some of these luminaries are having a tough go of it, and hedge funds have consistently underperformed the market in recent years: last year the average hedge fund made 3.3%; S&P 500 index gained 11.4%. At Instavest, we’re trying something slightly different. Here our lead investors work for tips (or donations). That’s right, instead of the traditional 2 & 20 rule, on our network the people who are putting their hard earned money at risk decide how much to “tip” the people managing that money. To further align incentives, we also require our lead investors to invest their own money upfront in every investment. If a hedge fund manager performed really well for you, would you give them a tip? We’ve found that most people do. Across our funds, the average tip that people give fund managers is 10.3% of the profits on an investment. 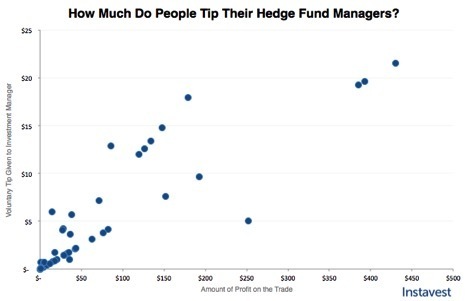 For hedge fund managers, working for tips might just work. 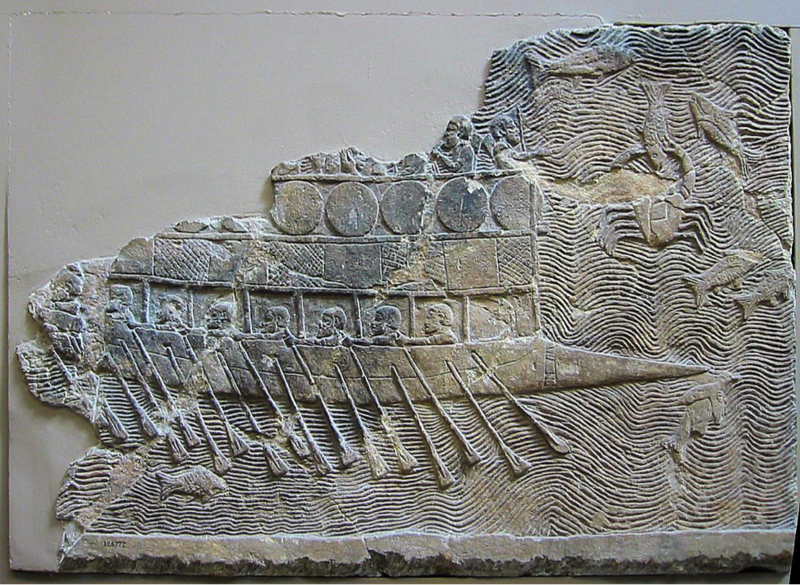 Phoenician sea captains took 20% of the profits from successful voyages. The 20% in the 2 & 20 rule dates back to the invention of hedge funds, but it was just as arbitrary then as it is now. In 1949, Alfred Winslow Jones, a journalist and sociologist, wrote an article in Fortune Magazine titled “Fashions in Forecasting.” The article laid the foundation of the modern hedge fund industry. Jones, the journalist, ended up becoming a financial pioneer. In the article, Jones examined the different tools market forecasters were beginning to use to perform better than the “standard, old-fashioned method” of buying and selling stocks. Most investors in the 1940s simply looked at the price of stocks, then at the real-world circumstances that ‘should’ affect its value, and bought the ones that seemed under-valued and sold the ones that seemed over-valued. The people Jones interviewed were doing things a bit differently, predicting the market’s less “rational” fluctuations and exploiting them for profit. The article covers and comments on many “tools” for market forecasting. But it does not reveal that in the course of his reporting, Jones had come up with some ideas about how he, personally, could use some of these tools. A few months before the article ran, he formed A.W. Jones & Company – a partnership of four friends. Together they invested $100,000 in the stock market and the modern hedge fund was born. Jones and his team, “invoking the Phoenician sea captains who kept a fifth of the profits from successful voyages,” took 20% of the fund’s investment gains. It was a rationale more befitting a social experiment than a business, which is exactly what the fund was when Jones started it: an experiment. The experiment transformed into a real business very quickly. Within a year, the fund had earned 17.3%. Within the decade, it had out performed every mutual fund by 87%. 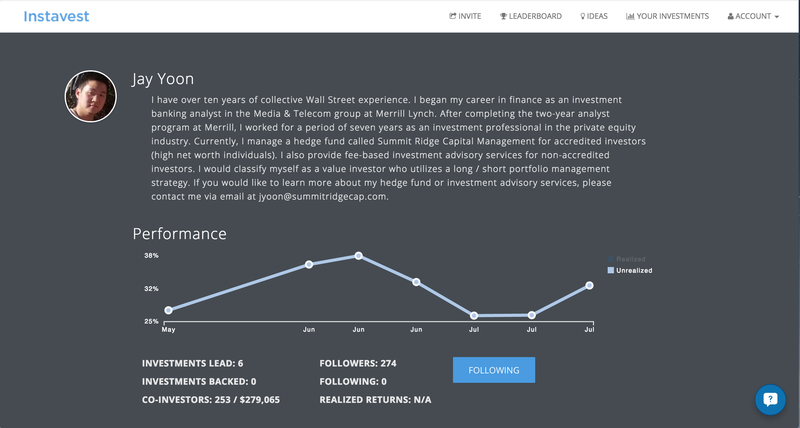 Jones promoted the fund by word of mouth, and its performance attracted more investors. Management talent joined the fund, some attracted by its payment schema, which rewarded good work very, very handsomely. Though it was chosen somewhat arbitrarily, investors were seeing such large returns that they were happy to keep paying 2% and 20%. Within two decades A. W. Jones & Company had earned a cumulative return of just under 5,000%. Loomis’ article coined the term hedge fund, and set off a kind of hockey stick moment for the industry. Jones had been a relatively quiet operator: to avoid regulation, (and, likely, competition), he’d avoided publicly advertising his firm. Loomis let the cat out of the bag. Following her article, hedge funds started to proliferate. It is estimated that between 140 to several hundred hedge funds were founded over the next three years. Since hedge funds depended on risky tools (there’s no ceiling to how much somebody can lose shorting stock), regulators restricted them to only the wealthiest investors. “Hedge funds would be allowed to try to make money almost any way they wanted, and charge whatever fees they liked,” Bloomberg’s article “Hedge Funds are for Suckers,” reads, “as long as they limited their investors to rich people who, in theory, could afford to lose whatever money they put in.” The plethora of new hedge funds quickly expanded their toolboxes to include a lot of not necessarily “hedged” investment strategies. The 20% performance fee, set as the “industry standard” back when A. W. Jones & Company was the only company in the industry, persisted. This 20% fee is referred to as “carry” is typically applied to the profits the hedge fund generates that are in excess of some benchmark. They also started charging a standard 2% management fee, rain or shine, to “keep the lights on.” This makes a certain kind of sense. As The New Yorker’s John Cassidy pointed out, like most secretive industries this is one in which, often, “price [is interpreted] as a signal of its quality.” Put another way, nobody wanted to hire a ‘discount’ hedge fund manager. In pure dollar terms, there are more resources, advanced degrees, and computing firepower devoted to chasing this elusive goal than almost any other endeavor, and that may include fighting wars, Yet traders face the immutable fact that every second, each megabyte of information, blog post, one-line rumor, revenue estimate, or new product order from China has already been taken into account by the efficient market and reflected in a security’s price. This means that trying to gain what traders call an “edge,” at least legitimately, is almost impossible. A common buzzword in hedge fund marketing is alpha: the elusive “edge” hedge funds have over the (in the long term) ever-rising stock market. A thesis of the Bloomberg article, backed-up by research out of Yale School of Management, is that hedge funds face a problem of “overcapacity.” There just might not be enough alpha to go around anymore. 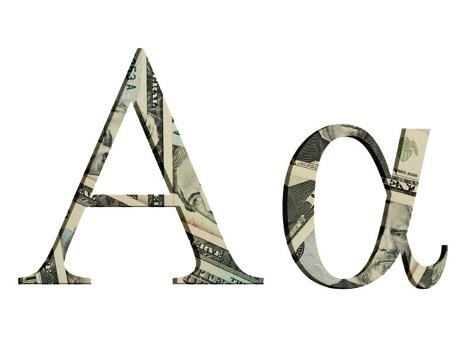 In fact, there’s so little, and hedge funds are so expensive, alpha might be negative. When you consider the fact that last year the S&P 500 index gained 11.4%, the average hedge fund only made 3.3%, your money was obviously better off in an S&P 500 index fund. But there’s more to the story: index funds aren’t actively nor riskily managed, so the managers take comparatively tiny management cut: 0.01%, and no performance fee. The 20% performance fee hedge funds take is on the total earnings, not on how much those earnings outperform the other options. At Instavest, we are a financial startup backed by investors like Y Combinator that’s trying offer to ordinary investors the opportunity to co-invest with lead investors (think hedge fund managers), without mystery, and without the absurd fees that characterize the industry. In fact, we don’t charge any fees at all. If you invest with an Instavest lead investor, if they make money for you, you decide how much of the profits you want to tip them. You can tip them 5%, 10%, 0%, or anything you want. You might think people would be tempted to stiff their lead investors on the tip. 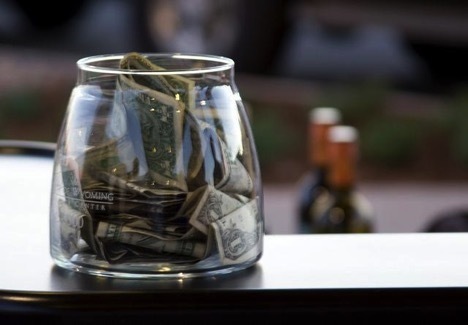 In fact, the average tip is 10.3% of the profits when the co-investor unwinds their position. That number is pretty constant, the more profit you return to investors, you still get about a 10% tip. One such lead investor is Donald Dion. He was once the youngest CFO of any NYSE-listed company, and his money management business handled over $900 million in assets. Now he has retired to only managing his family’s assets: DRD Investments, LLC. Whenever he has a particularly good idea for an investment, he makes the investment and posts it on Instavest, along with the reasoning behind it. Dion says he uses the Instavest community as a sounding board. If people choose to copy him on idea, i.e. co-invest, he takes it as another indicator that it may be a good idea, and might invest more. He does the same for other people on the site who post their investments, gauging whether he should follow their choices both by their reasoning and their track records. This also removes a lot of the secrecy and guesswork from wealth management. While both he and Dion want to raise their standing in Instavest’s community of investors and gain influence and followers, Yoon has an ulterior motive. He plans to launch his own hedge fund within the year. He sees online communities like Instavest as a means to get his name out there and build a brand for himself as a savvy investor. Perhaps because he’s been able to demonstrate so much clear-cut success with his investment ideas, he’s been able to build a following on Instavest faster than on any other investment community. “I had my doubts going in,” Yoon says. “But this has been a really easy way to promote myself, my business.” Plus, he adds, the tips aren’t too shabby either. Sign up for Instavest now get access to curated research and winning investments.